Hiding sections using Adblock Plus is pretty straightforward once you figure out the format. Right-click the Ablock Plus icon and bring up the Filter Preferences. Under Custom Filters, I have two sections: Exception Rules and Ad Blocking Rules. Use the Actions drop-down menu on the Ad Blocking Rules to Show Filters. For each section you want to hide, click the Add Filter button and enter the text describing what to hide (the rule). For a lot more information about filters and how to write them, Adblock Plus has a helpful page called Writing Adblock Plus Filters. 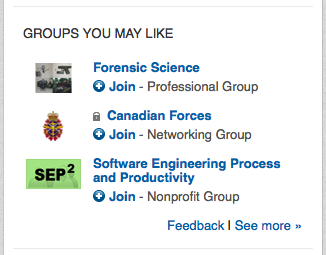 Obviously the one that prompted this—the LinkedIn Today blob at the top of the updates. Now when you reload the page, all these useless distractions will be gone. Enjoy the simplicity! This will get rid of the “Sponsored Content” in your feed. Thanks for taking the time to comment Martin – good additions! Thanks for the filter help. Shame there’s soo much junk on linkedin. 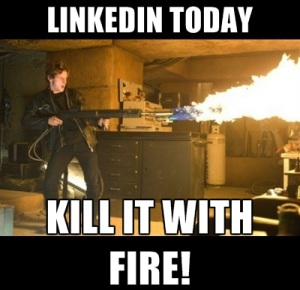 Don’t use Facebook & finding it hard to come up with reasons to stay on linkedin. Really dislike targeted marketing in general. Thanks again for the help. Just now I cut and paste all of these into adblocker (using Safari) now Pulse and all the other appalling Linkedin advertising is gone! I had tried various recommendations from other sites but they didn’t work. Thank you Andy for taking the time to post this. Hope other’s that dislike Pulse as much as I do find this page as well. I’ve been using AdBock Plus for so long I’ve forgotten what the web looks like with ads. Wow talk about a freaking life saver. Can’t believe there was a REAL way to take care of this!!! I’m just here because of the suggested jobs stuff (growyourcareerbyfollowing, jobsForYou, companiesforyou etc.). I am SO happy at my job why do I have to see LinkedIn trying to show me other positions every single time I log in? Lol. Is there any way to eradicate or ghost the section that says “jobs you may be interested in” on the home page? I’ve since switched to using the uBlock Origin plugin – it’s lighter-weight but maybe not quite as user-friendly. The filters are the same though. I think that will get rid of the job stuff for you.